Have you ever wondered how a family of 5 bears fits into one little tree? While getting ready to illustrate our upcoming book, The Berenstain Bears Show & Tell we wondered the same thing! We’ll go back through the years to the Bear’s home how it first appeared, and how it has evolved to its current state in our newest book. 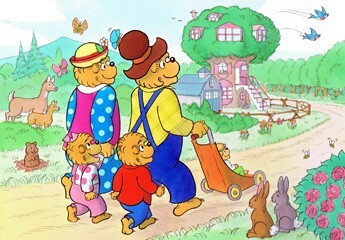 A bi-section of the Bear’s Tree house was first seen in 1974’s The Berenstain Bears and the New Baby. In this iteration we see a two storied house. The first floor featured mainly the kitchen and a small family den, while the second floor houses Mama & Papa’s room and a little room for Brother Bear. The Next full view of the house comes in 1979’s The Berenstain Bears Activity Book. In this iteration two levels are added: a Basement, and now a third story for Brother & Sister’s rooms. While getting ready to draw an updated bi-section of the Bear’s Tree house, there were a few complications. First off the Bears’ tree house has changed a bit over the years. When illustrating the interiors of the house, the illustrator has more freedom to add space and the tree house feels more like a regular home. However, it gets tricky when fitting these rooms into a cylindrical house in the trunk and branches of a tree. The house is a lot like Mary Poppins’ Bag, much more spacious inside than it appears outside! The Basement has not changed much over the years, you can still see the roots of the tree coming down from the ceiling like stalactites, and it functions like most basements do: storage, and a little dark and creepy to cubs. Both of these rooms have definitely changed over the years. The Bear Family kitchen first appeared very rustic, with an old time-y stove and love of pots and pans hanging from hooks on the wall. The Bears’ kitchen now is much more modern, with a sink, cabinets, and refrigerator. The Living Room has also expanded from a little TV and a bench in a den off the kitchen to an entire room with a Couch, easy chair, and room for the Bear Family to spread out. In “The Messy Room” The cubs had a LOT of stuff. In subsequent books the Cub’s room has been greatly simplified and they seem to have streamlined all of the clutter while still keeping their classic bunk beds. Much like the basement the attic has not changed much. At one point it was changed to Honey Bear’s new room, but in books since it has switched back to an attic full of antique treasures. So finally we have an updated version of the Bears Tree house, ready for 2017 in our new book The Berenstain Bears Show & Tell coming out May 2, and available for pre-order now. Wow, this is so cool! It didn’t occur to me until you showed this that yes, the house has changed. Before it was much more rustic – I think I prefer that look – but still, it’s amazing to see how this has changed.